We had a great weekend. Ms. Lynn from Huntsville, AL came to visit us. She arrived on Wednesday evening and stayed until Sunday. This was her first real visit with Addison Claire. Addison loved her too! She really seems to like everyone these days, although she does have to warm up a little before she shows her true personality. Addison was a real trooper as we shopped and went all over Mobile each day. She loved wearing Ms. Lynn's shoes and using her lotion. 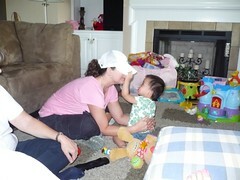 Addison taught Ms. Lynn her favorite song, "Head, Shoulders, Knees, and Toes." She also learned the Elmo song! We already miss her and hope she'll come back real soon and bring Mr. Chris with her. See more photos of Ms. Lynn's visit here.